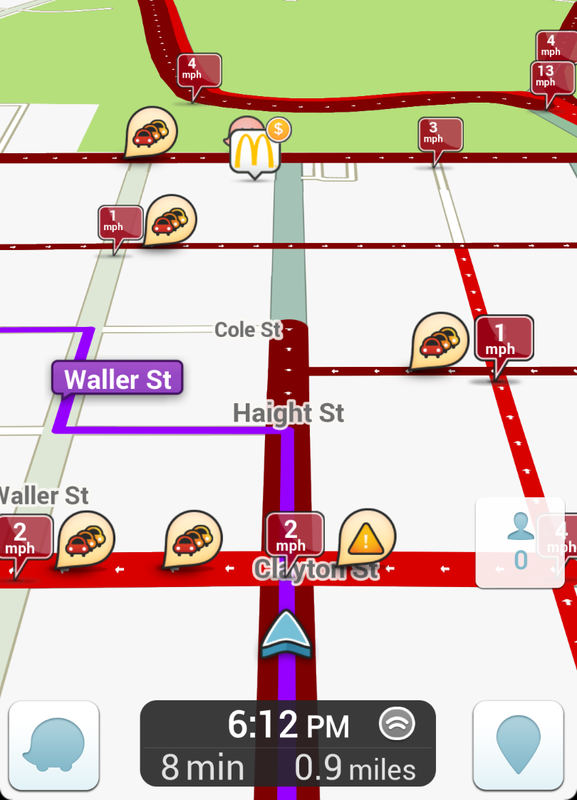 About a year or so ago I started regularly using the Waze app – which is to say, I started using it on familiar routes: to and from work, going to the ballpark, maneuvering across San Francisco for a meeting. Prior to that I only used the navigation app as an occasional replacement for Google Maps – when I wasn’t sure how to get from point A to point B. Of course, Waze is a revelation for the uninitiated. It essentially turns your car into an autonomous vehicle, with you as a simple robot executing the commands of an extraordinarily sophisticated and crowd-sourced AI. But as I’m sure you’ve noticed if you’re a regular “Wazer,” the app is driving a tangible “flocking” behavior in a significant percentage of drivers on the road. In essence, Waze has built a real time layer of data and commands over our current traffic infrastructure. This new layer is owned and operated by a for-profit company (Google, which owns Waze), its algorithms necessarily protected as intellectual property. And because it’s so much better than what we had before, nearly everyone is thrilled with the deal (there are some upset homeowners tired of those new traffic flows, for instance). Since the rise of the automobile, we’ve managed traffic flows through a public commons – a slow moving but accountable ecosystem of local and national ordinances (speed limits, stop signs, traffic lights, etc) that were more or less consistent across all publicly owned road ways. Information-first tech platforms like Waze, Uber, and Airbnb are delivering innovative solutions to real world problems that were simply impossible for governments to address (or even imagine). At what point will Waze or something like it integrate with the traffic grid, and start to control the lights? We’ve already been practicing solutions to these questions, first with the Web, then with Google search and the Facebook Newsfeed, and now with Waze. But absent a more robust dialog addressing these issues, we run a real risk of creating a new kind of regulatory capture – not in the classic sense, where corrupt public officials preference one company over another, but rather a more private kind, where a for-profit corporation literally becomes the regulatory framework itself – not through malicious intent or greed, but simply by offering a better way. Public common services delivered by for-profit corporations has been the political dog-fight between the left and right for the last 40 plus years. One side wants to minimize government to the essentials and eliminate corporation tax to zero. The other side wants the reverse. For 50% of the population it is nervana and for the other 50% it is a nightmare. It is also a further data point showing the hollowing out of the middle-classes. Co-incidently, this conversation is playing out right now in the presidential nominee races between the two outsiders of each party. Also interesting is that the largest capitalized company in the world also has the largest government lobbying spend not only in the US but other countries too. Next Next post: Should a Company Have a Soul?